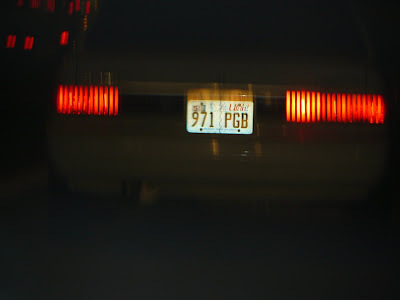 Have you ever been driving down the highway having a deep conversation with your significant other when you spot a license plate that bears the initials of your first born? This happened to me. Don't be jealous. Excellent timing I must admit actually having my significant other in the car driving so I could capture a picture of it. I must say it was really difficult...The poor people likely thought they were being chased by the paparazzi, the flash on my camera blinding them as we traveled down the I-15..
Stuff like this brings good luck you know. Totally worth the risk. I used to do this when I was unmarried but very much wishing I could be married to you know who.. 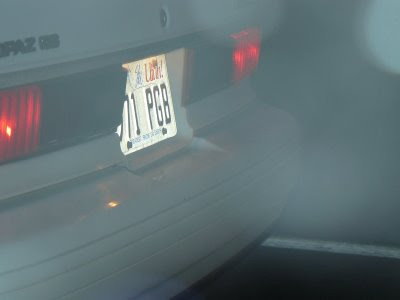 I spent all my driving time looking for a license plate that bore the letters JMB. I found one and that's when my man finally decided after 8 years of me hot on his heels that he would have me. Thanks honey. I told you it brings good luck. New baby intials?? LOL~ it seems I am always writing about a new baby on your blog!